A one-a-day 30 Day supply of Movita Multivitamin in our resealable pouch. 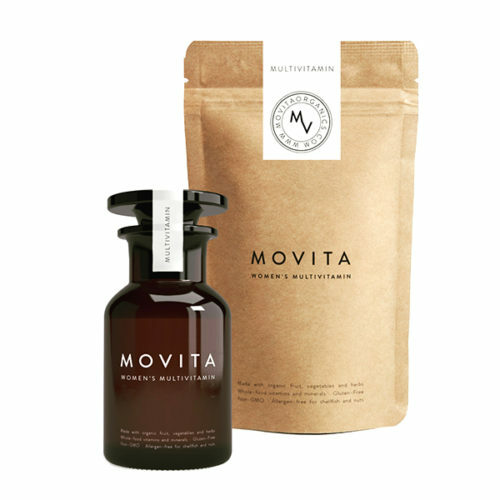 And when you discover that you love what the Movita Life has to offer check out the monthly subscription. It is a better value in every way! Everything essential. Tailor-made for women. We’ve created a single multivitamin that addresses the specific needs of women: breast and reproductive health, bone density, heart health, digestion, energy, immunity, and stress reduction. Using our proprietary GPM™ fermentation process, the ingredients in our multivitamin are individually grown in a dual prebiotic and probiotic culturing process that binds the vitamins and mineral to glycoproteins making them easy to digest and easier to absorb. It’s simply whole fruits, vegetables, and herbs cultured to their best state so you can be your best self. Purchase pouches as a one off or use them to refill your bottle! Turmeric Powder*, Fruit Blend* (Strawberry, Cherry, Blackberry, Plum, Blueberry, Raspberry), Soy Fiber*, Gum Arabic*, Broccoli Sprout Powder*, Kale Sprout Powder*, Cauliflower Sprout Powder*, Cabbage Sprout Powder*, Organic Fermented Veg. Powder Blend*(Beet Powder, Carrot Powder, Broccoli Powder, Cucumber Powder, Kale Powder, Tomato Powder, Spinach Powder, Cabbage Powder, Cauliflower Powder, Celery Powder, Parsley Powder, Asparagus Powder, Brussel Sprouts Powder, Green Bell Pepper Powder, Garlic Powder, Ginger Powder, Onion Powder. Culture Media: Organic Soy Flour, Organic Gum Arabic, Organic Maltodextrin, Organic SC Yeast, Lactobacillus acidophilus, Lactobacillus rhamnosus, Bifidobacterium bifidum, Papain, and Bromelain. Get 25% off your very first Order. Health delivered to your doorstep!